Flood frequency analysis is one of the techniques of examination of peak stream flow frequency and magnitude in the field of flood hydrology, flood geomorphology and hydraulic engineering. In the present study, Log Pearson Type III (LP-III) probability distribution has applied for flood series data of four sites on the Mahi River namely Mataji, Paderdi Badi, Wanakbori and Khanpur and of three sites on its tributaries such as Anas at Chakaliya, Som at Rangeli and Jakham at Dhariawad. The annual maximum series data for the record length of 26-51 years have been used for the present study. The time series plots of the data indicate that two largest ever recorded floods were observed in the year 1973 and 2006 on the Mahi River. The estimated discharges of 100 year return period range between 3676 m3/s and 47632 m3/s. The return period of the largest ever recorded flood on the Mahi River at Wankbori (40663 m3/s) is 127-yr. The recurrence interval of mean annual discharges (Qm) is between 2.73-yr and 3.95-yr, whereas, the return period of large floods (Qlf) range from 6.24-yr to 9.33-yr. The magnitude-frequency analysis curves represent the reliable estimates of the high floods. The fitted lines are fairly close to the most of the data points. Therefore, it can be reliably and conveniently used to read the recurrence intervals for a given magnitude and vice versa. 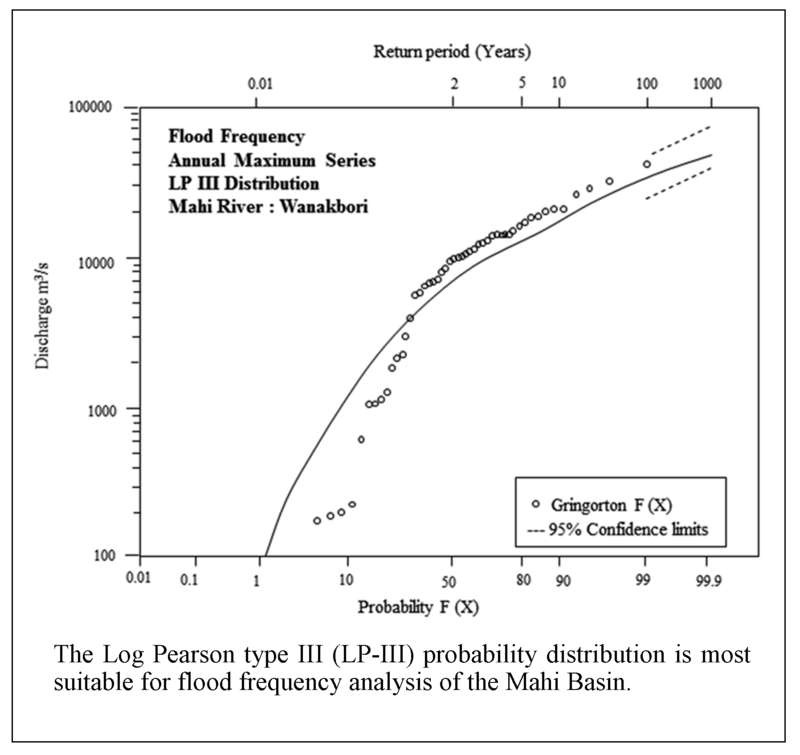 The Log Pearson type III (LP-III) probability distribution is most suitable for flood frequency analysis of the Mahi Basin. The magnitude frequency analysis shows that the fitted lines are fairly close to the most of the data points. The return period of the Qm, Qlf and Qmax seems to be very reliable. The estimation of the discharges for the 100-yr flood is close to the observed Qmax discharge.